What Are The Different Beachbody Coach Ranks? - Beachbody Levels Explained! If you are a new Beachbody Coach, or have been doing some research on becoming a Beachbody Coach and looking for an explanation on how the Beachbody Coach ranks work, you’ve come to the right place. At first glance the Beachbody Coach ranks can seem complicated, but it really isn’t. In this post I’m going to break down the Coach ranks and levels for you in simple terms and make it easy to understand. First, if you’re not an Emerald Beachbody Coach yet, my advice to not worry about understanding every little detail about every rank, you don’t need to know that information right now. All you need to know is what you have to do to advance to the first rank of Emerald. One you are Emerald, then you look forward to Ruby. The point is, don’t get stuck trying to learn all of the specifics. In this business, having a “I’ll cross that bridge when I come to it” mentality can be an asset. Trust me, don’t spend time worrying about how to advance in rank to Diamond if you’re not even Emerald yet. Focus your energy on getting to Emerald. But I know some of you MUST know how the ranks work, so I explain it all below. Beachbody Coach Ranks – What Are Different Levels? 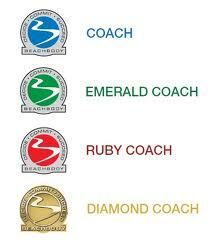 There are 4 different Beachbody Coach ranks, Emerald, Ruby, Diamond, and Star Diamond. To make my explanation simple, lets assume that whenever I mention a personally sponsored Coach, the Coach has signed up on Shakeology HD, which would make them an active Coach. Because if you sponsor someone into the business, and they never buy anything, or sell anything, they would be considered inactive and not be relevant or affect the rankings anyhow. Emerald – For a Beachbody Coach to reach Emerald status, they need to personally sponsor 2 other active Coaches into the business, 1 in their left leg, and one in their right leg. That is all is takes to reach Emerald status. 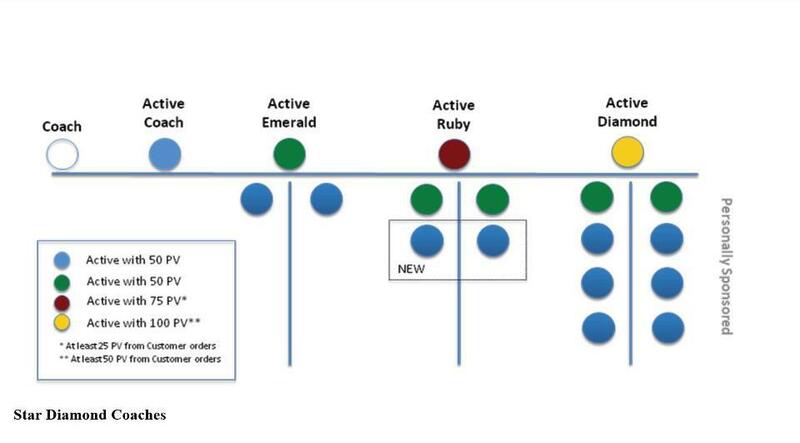 Ruby – To reach Ruby, a Coach need to personally sponsor 4 Coaches total, 2 in their left leg, and 2 in their right leg, 2 out of the four need to be Emerald themselves, and the 2 Emeralds need to be in different legs. Star Diamond – To be a Star Diamond, you must have a personally sponsored Coach that has reached the rank of Diamond. No worries, sometimes a video is the best way to explain something. Below is an video of me explaining the Beachbody Coach ranks. From the image above you should be able to easily tell how to move up the Beachbody Coach ranks, but whats the difference? Why is being Diamond better than Emerald? The cycle bonus amount a Coach earns depends on what rank they are, and because it is possible to cycles dozens of times a day, the difference could potentially be significant. So from the numbers listed above, you can see that an Emerald Coach can only earn up to $250 a week in cycle bonuses, so if you are thinking about becoming a Beachbody Coach, you should have your long term goal set at Diamond and Star Diamond right from the start. Don’t plan to advance in rank to Emerald and stay there, Emerald is just your first stepping stone. It will take some time to get to the higher ranks, but with hard work and persistence it can be done. The only way to fail is to give up. Again, my recommendation is to learn all of this stuff as you go. Just set your goal on reaching Emerald, then go from there. I really didn’t learn about how all of this worked until checks started to come in, then it started to make sense.